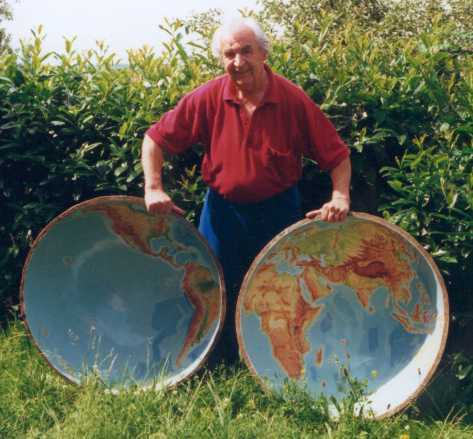 In Fig.2 on the left you are looking at a demonstration model of the inside world (geocosmos) with Helmut Diehl. You are looking at the inside of the two halves of the earth. Surely you must have thought that the earth in Fig. 1 (photo) was a solid, convex sphere. A satellite camera does not see anything different either when it uses curved light rays while photographing the inside of the earth. A satellite photo therefore, of the hollow earth, appears to us as a solid convex sphere, as shown in Fig.1. Our old habits of thinking are deceiving us. After understanding this optical illusion you can switch back to the starting page. On the other hand you may also want to look at the photograph of the optical illusion of North and South America which is shown in Fig. 3. The comparison between the satellite photo and the photos made of the inside world model is not 100 % correct. A satellite photo produces the optical illusion using the curved light rays. The photos made of the inside earth model (geocosmos) causes an optical illusion due to our habits of thinking. In the photos taken I cut off the part that showed the shell around the hemisphere. If instead I had left it on, we would recognize that this photo was taken of a hemisphere. As long as the surrounding area of the hemisphere is black we assume it to be space. These optical illusions are to show, that a satellite photo can not prove whether we live on a solid, convex earth or on the inside surface of a hollow sphere.